At Washington Orthopaedics & Sports Medicine, we always strive to return patients to their pre-injury level of activity. Many of our surgeons and therapists are current or former athletes, so we understand just how important your morning run, weekend bike ride, or Sunday round of golf is. Unfortunately, some injuries and surgeries require patients to make modifications and accommodations in order to return to their respective sport. Yoga in particular tends to be difficult for patients after wrist, knee, and hip surgeries. 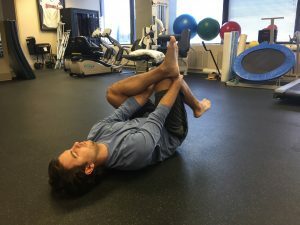 In this article, we’ll discuss the many benefits of yoga and modifications to common poses that often prove challenging after surgery. There are few exercise modalities that offer the multitude of benefits that yoga can. Studies have repeatedly shown that yoga increases strength and flexibility, and improves balance. Yoga can also help people manage their weight, improve bone density, and even reduce markers of cardiovascular and metabolic disease. What really separates yoga from other forms of exercise is its effect on mental health and emotional well-being. All exercise has the capacity to make us feel good. There’s a sense of accomplishment after working out; runners often report a massive rush of endorphins known as a “runner’s high,” but these effects are usually transient and short-lived. Yoga, on the other hand, has the ability to create lasting changes that result in improved mood, concentration, and reduced stress. Yoga has even been used as a palliative treatment for terminally ill and clinically depressed patients. Yoga poses that require the wrist to bend to extremes or bear a lot of weight are often too painful for patients with a history of wrist problems. By using props or bearing weight through the knuckles and forearms, these issues can be easily circumvented. 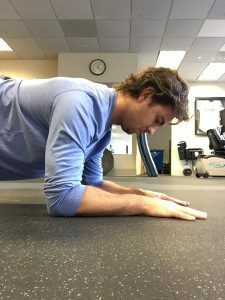 Weight bearing through the wrist: When required to bear weight through the wrists, first strive for a position that includes fingers spread, elbow actively extended, forearm vertical over wrist, and weight distributed between palm and fingers. 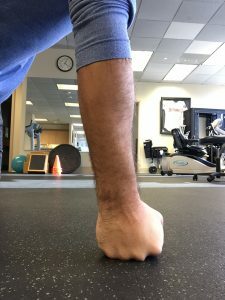 Weight bearing through fist: When pain or motion limitation prevents weight bearing through an extended wrist, try making a fist and using knuckles to bear weight. This keeps the wrist in a neutral position without altering the yoga pose. 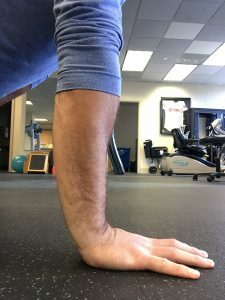 Weight bearing through forearm – When you are unable to place any weight on the wrist, many poses can be modified so that the weight is distributed across the whole forearm. Weight bearing against the wall: In some cases, the position itself may need to be moved to alleviate weight-bearing pain. This Downward Facing Dog variation is an excellent example. Much like the wrist, when the knees are required to fully bend or bear weight through the kneecap, pain often becomes a limiting factor. 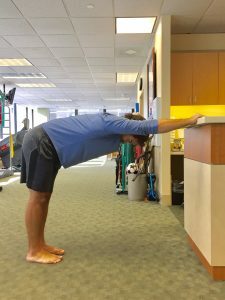 By using different body positions or towels for support, these poses can be adapted for patients even after knee replacement. Towel modification: Place a towel behind your knees if it is too painful to fully flex them in kneeling positions. Pillow modification: A pillow or rolled up yoga mat can be placed behind the knees if the towel does not provide enough relief. 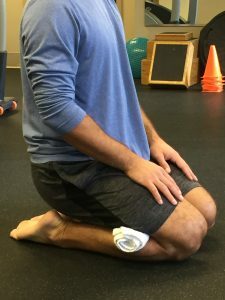 Weight bearing modification: Like the wrists, injured or post-surgical knees may not be able to safely bear the weight required by some yoga positions. In that case, change the body position like this supine variation of Pigeon pose. Hip flexibility can limit the ability to comfortably achieve many yoga poses. 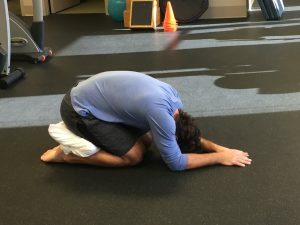 In some cases, such as those with impingement, hip dysplasia, or post-hip replacement, these poses will require blocks to reduce the range of motion required. Using blocks: Reduce the range of motion required for some poses by using blocks to bring the floor closer to you. 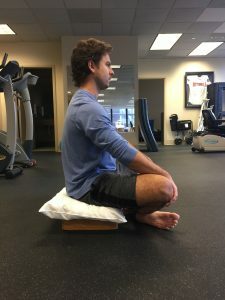 Seated positions – Seated yoga positions like Lotus pose can be made more comfortable with blocks, mats, pillows, or towels to lift the seat higher off the ground. Yoga is supposed to be challenging, not painful. If you can’t get through a yoga class comfortably, don’t give up on it—find smart ways to work around it. Try these modifications or give one of our therapists a call to help you create personalized strategies. For more information about exercises associated with yoga, email us or request an appointment. Be sure to follow us on Facebook and Twitter as well! 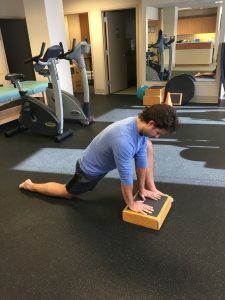 Kevin McGuinness is a physical therapist at the SMARTherapy Center at Washington Orthopaedic & Sports Medicine and is a Certified Strength and Conditioning Specialist. 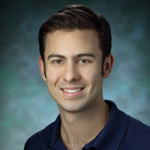 He received his Doctor of Physical Therapy degree from George Washington University in 2013 and works with a wide range of patient populations, including high school, college, and professional athletes, as well as patients with spinal cord and traumatic brain injuries.